Caption: A compilation of solar data from various instruments on SDO recording a flare on May 5, 2010. 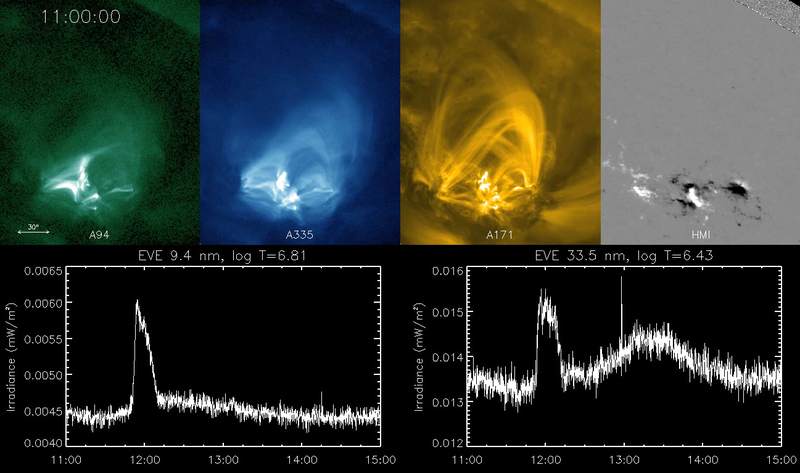 The images on top show the initial magnetic loops of the flare, and a delayed brightening of additional magnetic loops above the originals showing the late phase flare. Along the bottom, graphs from EVE show the extreme ultraviolet light peaking both in time with the main flare and the late phase flare. The sun's surface dances. Giant loops of magnetized solar material burst up, twist, and fall back down. Some erupt, shooting radiation flares and particles out into space. Forced to observe this dance from afar, scientists use all the tools at their disposal to look for patterns and connections to discover what causes these great explosions. Mapping these patterns could help scientists predict the onset of space weather that bursts toward Earth from the sun, interfering with communications and Global Positioning System (GPS) signals. Analysis of 191 solar flares since May 2010 by NASA's Solar Dynamics Observatory (SDO) has recently shown a new piece in the pattern: some 15 percent of the flares have a distinct "late phase flare" some minutes to hours later that has never before been fully observed. This late phase of the flare pumps much more energy out into space than previously realized. "We're starting to see all sorts of new things," says Phil Chamberlin, deputy project scientist for SDO at NASA's Goddard Space Flight Center in Greenbelt, Md. "We see a large increase in emissions a half-hour to several hours later, that is sometimes even larger than the original, traditional phases of the flare. In one case on November 3, 2010, measuring only the effects of the main flare would mean underestimating the amount of energy shooting into Earth's atmosphere by 70 percent." The entire space weather system, from the sun's surface to the outer edges of the solar system, is dependent on how energy transfers from one event to another – magnetic reconnection near the sun transferred to movement energy barreling across space to energy deposited into Earth's atmosphere, for example. Better understanding of this late phase flare will help scientists quantify just how much energy is produced when the sun erupts. The team found evidence for these late phases when SDO first began collecting data in May of 2010 and the sun decided to put on a show. In that very first week, in the midst of an otherwise fairly quiet time for the sun, there sprouted some nine flares of varying sizes. Flare sizes are divided into categories, named A, B, C, M and X, that have long been defined by the intensity of the X-rays emitted at the flare's peak as measured by the GOES (Geostationary Operational Environmental Satellite) satellite system. GOES is a NOAA-operated network of satellites that has been in geosynchronous orbit near Earth since 1976. One of the GOES satellites measures only X-ray emissions and is a crucial source of information on space weather that the sun sends our way. That May 2010, however, SDO observed those flares with its multi-wavelength vision. It recorded data indicating that some other wavelengths of light weren't behaving in sync with the X-rays, but peaked at other times. "For decades, our standard for flares has been to watch the x-rays and see when they peak," says Tom Woods, a space scientist at the University of Colorado, Boulder, Colo. who is first author on a paper on this subject that goes online September 7 in the Astrophysical Journal. "That's our definition for when a flare goes off. But we were seeing peaks that didn't correspond to the X-rays." Woods says that at first they were worried the data were an anomaly or a glitch in the instruments. But as they confirmed the data with other instruments and watched the patterns repeat over many months, they began to trust what they were seeing. "And then we got excited," he says. Caption: Instead of a conventional picture, the EUV variability Experiment (EVE) on board SDO produces graphs like this (at right), called spectra, that show the total intensity of any given extreme ultraviolet (EUV) wavelength of light coming off of the sun. This image shows a single moment from May 5, 2010. The height of each vertical line represents how much energy is present in that particular wavelength. Spectra like this can measure energy from the sun more comprehensively than instruments that can only “see” a single wavelength. Recording extreme ultraviolet light, the EVE spectra showed four phases in an average flare's lifetime. The first three have been observed and are well established. (Though EVE was able to measure and quantify them over a wide range of light wavelengths better than has ever been done.) The first phase is the hard X-ray impulsive phase, in which highly energetic particles in the sun's atmosphere rain down toward the sun's surface after an explosive event in the atmosphere known as magnetic reconnection. They fall freely for some seconds to minutes until they hit the denser lower atmosphere, and then the second phase, the gradual phase, begins. Over the course of minutes to hours, the solar material, called plasma, is heated and explodes back up, tracing its way along giant magnetic loops, filling the loops with plasma. This process sends off so much light and radiation that it can be compared to millions of hydrogen bombs. The third phase is characterized by the sun's atmosphere -- the corona --losing brightness, and so is known as the coronal dimming phase. This is often associated with what's known as a coronal mass ejection, in which a great cloud of plasma erupts off the surface of the sun. But the fourth phase, the late phase flare, spotted by EVE was new. Anywhere from one to five hours later for several of the flares, they saw a second peak of warm coronal material that didn't correspond to another X-ray burst. "Many observations have spotted an increased extreme ultraviolet peak just seconds to minutes after the main phase of the flare, and this behavior is considered a normal part of the flare process. But this late phase is different," says Goddard's Chamberlin, who is also a co-author on the paper. "These emissions happen substantially later. And it happens after the main flare exhibits that initial peak." To try to understand what was happening, the team looked at the images collected from SDO's Advanced Imaging Assembly (AIA) as well. They could see the main phase flare eruption in the images and also noticed a second set of coronal loops far above the original flare site. These extra loops were longer and become brighter later than the original set (or the post-flare loops that appeared just minutes after that). These loops were also physically set apart from those earlier ones. "The intensity we're recording in those late phase flares is usually dimmer than the X-ray intensity," says Woods. "But the late phase goes on much longer, sometimes for multiple hours, so it's putting out just as much total energy as the main flare that typically only lasts for a few minutes." Because this previously unrealized extra source of energy from the flare is equally important to impacting Earth’s atmosphere, Woods and his colleagues are now studying how the late phase flares can influence space weather. The late phase flare is, of course, just one piece of the puzzle as we try to understand the star with which we live. But keeping track of the energy, measuring all the different wavelengths of light, using all the instruments NASA has at its disposal, such information helps us map out all the steps of the sun's great dance. On May 5, 2010, shortly after the Solar Dynamics Observatory (SDO) began normal operation, the sun erupted with numerous coronal loops and flares. Many of these showed a previously unseen "late phase flare" appearing minutes to hours after the main flare.